The manual GQ EMF-360/ EMF-360+/EMF-380 EMF Multi-Field/Multi-Function Meter User Guide Revision 1.2 Jul-2018 is confusing so here are some thoughts and questions for clarification. I have the EMF-380 in mind. The frequency response is given as up to 7 GHz but no minimum is given. What is it? (I expect different values for different sensors.) Throughout the manual whenever EMF is mentioned, the display only shows the magnetic component. On page 10 of the manual, a display shows Electric field on one side and electromagnetic field on the other. This makes no sense because the electromagnetic field has two components: electric and magnetic (and has no frequency implication), so one number cannot show EMF. In the near field the electric field cannot be derived from the magnetic field and conversely. The same page shows s spectrum with the vertical axis being power. The only power this instrument can measure is power from the antenna and with a wide bandwidth antenna operating as a voltage source, the reactance will be very high and very frequency dependant while the radiation resistance is very low over most of it�s range so the receiver impedance needs to be very high, then the power received will be very very low. If the antenna operates as a wide band current source, it needs to be an inductor and the receiver needs to approach a short circuit, still the power received will be extremely low and not useful as an indicator of the ambient EMF. The user does not care about the power received, but rather the field strength that gave rise to that power. In addition the display shows a peak power of 1.0E-9 W but an average power of 1.0E-12 W. How are these values determined? The user would like to know things like total power/area over the band (units like mw/m^2) and power/(bandwidth*area) (units like mw/(Hz*m^2) in a specific channel as average and instantaneous peak values. What are the power numbers shown intended to mean? The manual gives two resolutions for electric field: 100 mv/m and .1 mv/m, the later under RF but without indicating any minimum frequency. What are the lower frequency limits? The FCC allocates EM emissions from 9 KHz to 300 GHz so 9 KHz can be considered RF. There's a new version EMF-380V2 in amazon which have some improvements from the first version. You can download and watch a video from this link showcasing its features. The 7GHz is only for RF, but in V2, it is 8GHz. and from 10MHz RF mininum. from many different sensors. But in V2 there's a mode where you can see all the readings in 1 screen (EMF/EF/RF). The spectrum also uses different sensors with different RF bands and antennas. Those power values are being read from those sensors. And most of them are indeed low. The sensors receive them as dBm and those dBms are then converted to Watts or Watts/area. The peak values are the values of the bandwidth/frequency with the highest detected power or lowest power loss(-dBm). In that picture, 2.461 GHz has the highest power detected within the 2.4GHz band. that one looks like a WiFi signal. The average is now changed to sum of the power within the bandwidth even in V1 and also displays the power/area in a given band. 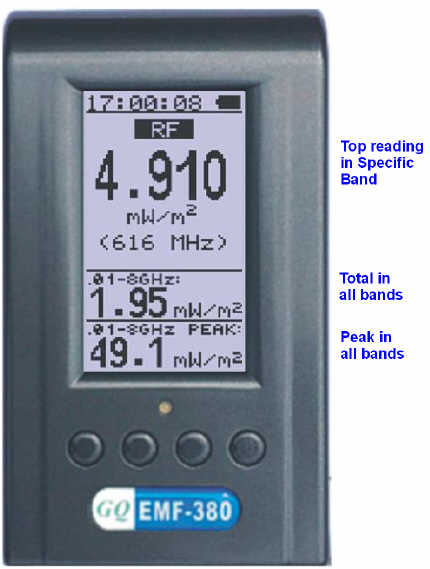 -In the RF mode (page16), that frequency refers to the frequency of the band with highest power/density from the sensors. Like the peak value in spectrum, but this one also includes other bands .01-8GHz. -The current field density refers to the large number converted to density. -The .01-8GHz (version 2) is the sum of all frequencies detected. -and the peak is the the max of that sum. Stores the max value of the .01-8GHz since reset. for the option to appear. Those are different RF bands you can read from the unit. No plan to add 1.8 GHz but in RF browser of 380V2, it can pick up cellphone signals (shown in video). >There's a new version EMF-380V2 in amazon which have some improvements from the first version. Where can I find a manual for the new version? >In vertical mode, EMF is different from EF. those 2 numbers are different and are not derived from each other. >The sensors receive them as dBm and those dBms are then converted to Watts or Watts/area. Watts and watts/area are dimensionaly different! I am seeing watts in the spectrum analyzer but as a end user I want watts/(area*bandwidth). I can estimate channel bandwidth but I have no idea how to go from receiver watts to field strength. >-The .01-8GHz (version 2) is the sum of all frequencies detected. How flat is the response over this huge range? While the large range is good, I would like to have some way of frequency discrimination. The spectrum analyzer does that over some bands but there are big gaps. For example, I would like to be able to treat 10MHz different from 5GHz. - I think the manual is already uploaded. - The watts/area can be estimated from power measured divided by the area of the antenna where we measured the power. - The response is better certain frequencies like 2.4GHz. That's not possible in this device. As long as it detects RF in that range, it doesn't know what frequency is't coming from. Except in spectrum. I don't understand why we have this problem. >- Yes those two numbers EF/EMF are from the same source one reads ef, and one emf. EMF (Electro-Magnetic-Field) has the two components: Electric can be measured in volts/meter and Magnetic can be measured in Gauss. >- The watts/area can be estimated from power measured divided by the area of the antenna where we measured the power. So what is the effective area of the antenna? I don't see that in the manual, but as I indicated previously, to achieve a wide bandwidth, the antenna and receiver will be VERY badly mismatched, so effective area will be very frequency dependent and not found from handbook values that assume a matched antenna. <There's a new version EMF-380V2 in amazon which have some improvements from the first version. I found the manual. Why is it not in your own store? It would save Amazon fees! Yes the EMF supposed to mean the "magnetic field" part of that field. 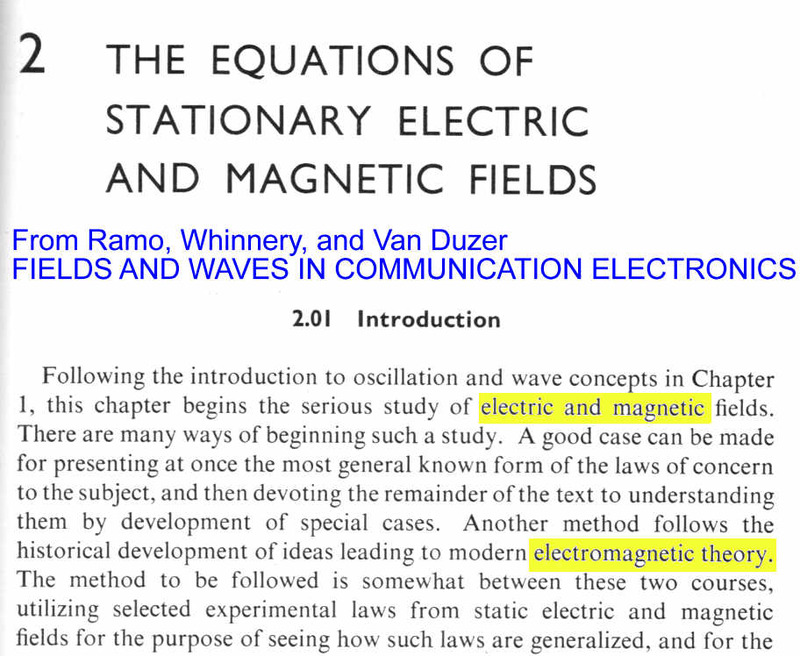 And EF is the "electric-field" part. I don't know the specifics value of those antennas but there's a lot of them. We will add it to the website soon. Em> Yes the EMF supposed to mean the "magnetic field" part of that field. And EF is the "electric-field" part. So why not say MF which is clear instead of EMF indicates both parts? Em> - The watts/area can be estimated from power measured divided by the area of the antenna where we measured the power. Em> I don't know the specifics value of those antennas but there's a lot of them. It looks like the power density at a single frequency is more than twice what it is in the instrument's entire detectable range. ro> as I indicated previously, to achieve a wide bandwidth, the antenna and receiver will be VERY badly mismatched, so effective area will be very frequency dependent and not found from handbook values that assume a matched antenna. How do you determine the field strength integrated over the entire detectable range? That is why should I believe the numbers rather than just take them as relative to other readings with the same instrument. I guess most people understand better that it's a magnetic field coming from an electronic device. I'm sorry that picture from the user manual is not correct(pic taken from demo software). The power density of total should always be greater than a single frequency. There is a different sensor that detects RF from that range.